Timeless solitaire engagement ring in beautiful platinum with contoured edges to add a slightly modern touch. Shown here with a princess-cut diamond, but can also be fit with a round or asscher cut diamond. This classic solitaire engagement ring in platinum is designed to be comfortable to wear with its rounded inner edges. Set this ring with a diamond of any shape and you'll have a beautiful, lasting piece of art. Simple and elegant, this solitaire engagement ring in platinum allows your diamond to take center stage. The four prong setting lets more of your center diamond's brilliance to shine through to please the eye. You can choose a round, princess, cushion, Asscher, emerald, oval, or radiant cut diamond. Simple, classic solitaire engagement ring in platinum with a cathedral setting to elevate and emphasize your center diamond. This setting is both budget-friendly and versatile, allowing a diamond of any size and shape to grace the main position on this ring. This beautiful solitaire engagement ring has a platinum band that's thin, but not too thin, and tapered in slightly at the top as it nears the diamond. A wire basket makes the center diamond stand out and turns this setting from a ring into a statement! This ring can be set with a round, princess, cushion, Asscher, or carre cut diamond. Timeless, simple, and classic, this platinum solitaire engagement ring features a six prong setting to secure and showcase your center diamond. Shown here with a round diamond, this ring can also be set with a marquise or pear shaped diamond. Beautiful contemporary solitaire setting in platinum. Solitaire diamond engagement ring with a thin band. This ring has a six-prong setting, instead of the usual four, to showcase your center diamond. You can set this timeless ring with a round diamond of your choice. This is a gorgeous solitaire engagement ring with a twist! If you look closely at the picture above, you can see one of the two "surprise" diamonds that is on either side of the center diamond. 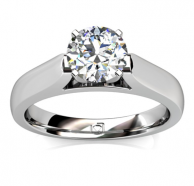 Beautiful six-prong solitaire engagement ring in platinum that's also budget-friendly. Sparkling surprise diamonds and a gleaming knife-edge band add spice to this otherwise classic solitaire engagement ring. The metal is platinum, which means it will be more durable than a gold ring, and just as beautiful (or more, if you prefer platinum!). This setting can be set with just about any shape or size diamond. The thin, petite band on this ring gives an elegant feel (although still durable, it's platinum!) and a beautiful, thin frame to emphasize your center diamond. Choose any shape or size diamond for this setting -- this ring is great for all size diamonds, including smaller ones because the thin band will make it look even bigger. 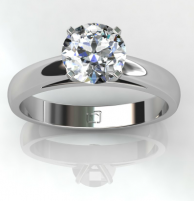 A nice solitaire setting in beautiful, sturdy platinum. Set this one with any diamond shape or size for a stunning, long-lasting engagement ring. Affordable platinum solitaire engagement ring. This thin solitaire engagement ring makes your center diamond stand out, and the prongs securing the diamond allow it to sparkle from all angles. This elegant solitaire setting can be set with a round, cushion, radiant, or Asscher cut diamond. Royal crown setting on this beautiful tapered solitaire engagement ring. Elegant engagement ring that will stand out in a crowd of other rings! This Cushion Cut Engagement Ring is the perfect way for you to symbolize your love to your future wife. They call it a "Bezel-Set" ring, but I prefer "Framed" because it looks like the diamond is surrounded by a beautiful platinum frame! 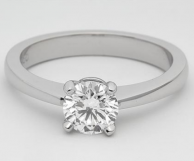 Elegant, simple platinum solitaire engagement ring with a thin band to make your center diamond stand out. You can choose a diamond of any shape and size to set in this ring. The edges of this platinum band have been softened for a clean, consistent shine. 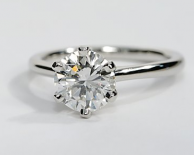 The cathedral setting arches upward as the prongs secure your center diamond. You can choose any shape diamond for this beautiful setting. This platinum solitaire engagement ring has a beautiful "surprise" -- two small diamonds accent both sides of the basket that secures your center diamond. Choose a diamond of any shape and any size to set in this gorgeous, simple ring. Specially designed for a princess-cut diamond, this platinum solitaire engagement ring displays your center stone in a secure, stunning double-prong setting. 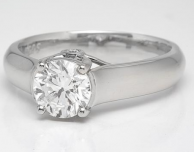 This elegant solitaire engagement ring in platinum creates beauty out of its simplicity. A classic, timeless style, this setting lends all attention to the center diamond of your choosing. You can set any shape and size diamond in the center of this setting. The basket holding the center diamond extends low in order to be even with the rest of the platinum band for maximum comfort while wearing. This solitaire engagement ring can be set with any size or shape diamond.